Saratoga Springs Visitors Guide: The #1 Saratoga Travelers Guide To Historic Saratoga Springs NY! 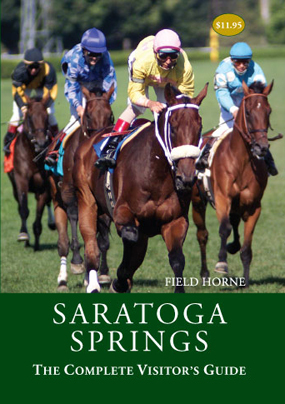 This handy pocket-sized book is the only Saratoga Springs guide you'll need! It includes all the information necessary to make the most of a visit to America’s oldest and best-loved resort town. This guide to historic Saratoga Springs is filled with history, interesting features, maps, and comprehensive listings of lodgings, restaurants, entertainment, and recreational opportunities. Find tips and suggestions that will make you an insider on your first day! Field Horne is an author of Saratoga history and culture and has written several books on Saratoga Springs. Order any of our books on historic Saratoga Springs with our easy online ordering form, or use our printed order form. Feel free to e-mail us with any questions. Probably the best thing I can tell you about Field Horne’s new guide to Saratoga Springs is that I decided to buy a copy for myself. Even though I have been visiting Saratoga on a regular basis for decades, I found a wealth of detail that makes me want to explore more. The guide is very user-friendly—attractive and arranged in three main sections, with intriguing trivia scattered throughout. Released just in time for the summer influx of visitors to the racetrack and the performing arts center, this pocket-sized guide is a very effective introduction to the area.